“Salmon farming along the British Columbia coast has expanded with encouragement from both Canada’s Department of Fisheries and Oceans (DFO) and the B.C. provincial government. Has the game changed or merely the players? How many people have been fighting for the salmon in BC? The F.N. people, Sandra Morton, Save our Salmon, (SOS) and hundreds of others. However, in Canada greed comes before common sense. Neither Harper nor the Campbell/Clark BC Liberals, give one damn about the salmon, or any of our eco system victims. The almighty dollar comes first. The dirty tar sands etal. Those dirty diseased fish farms should have been yanked out long ago. They say, the salmon are dying even before they spawn. The fish farms are gross and filthy. I have no idea how they will be able to clean that mess up? Will the salmon even be able to recover? 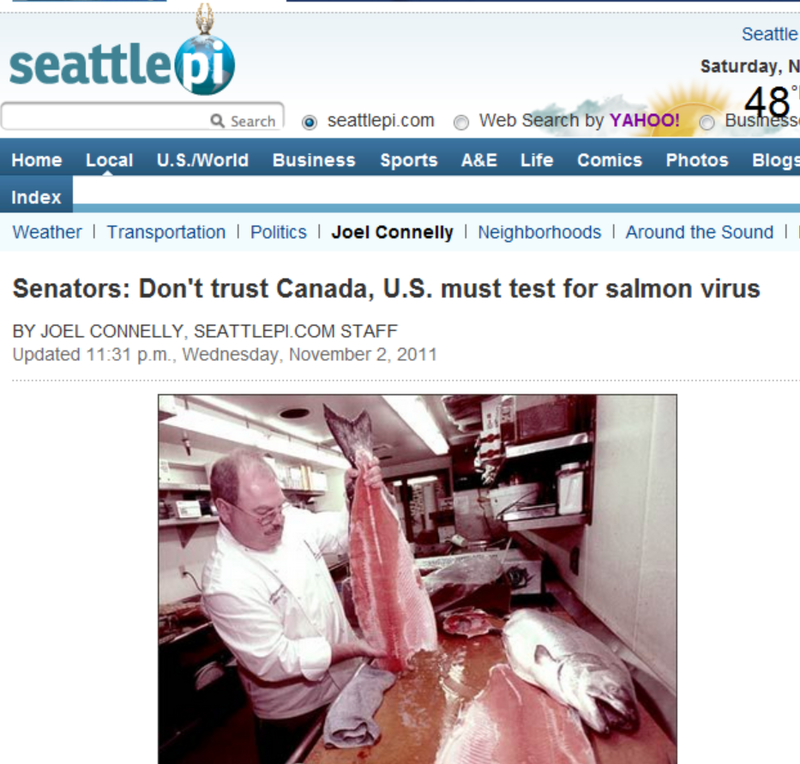 Won't the diseased wild salmon infect all, the wild salmon? How many years will it take, for the salmon to recover? How many of the rivers Campbell thieved and sold, were salmon runs? The salmon are under siege, in far too many situations. For some reason, Canada has produced the worst crop of politicians in Canadian history. Canada has become a corrupt hellhole of disaster. Time to clean house. Thank you for bringing this info forward. And…. thank you to the three insightful West Coast American Senators for 'getting the ball rolling' on this devastating issue. Where are our Canadian government counterparts on this issue? This should, I hope, put a stop to our governments 'cuts' in DOF spending for scientific studies into wild salmon decline. I totally agree with the above comments. It is up yo the fish farms to prove they are not harming the local ecosystems – not anyone else. The reference of course is to the BC provincial government. In my readings on the matter I have come to the conclusion that the federal government and the provincial government share the same view of the fish farm industry. Harper muzzles scientists from DFO who were due to testify at the Cohen Commission of Inquiry, and the BC government actively promotes the industry supposedly because of the taxes they collect from the industry. So, I am puzzled. The aims of both levels of Canadian government seem very much to be short term, whereas the concerns of the US senators' letter is very much long term: the threat of collapse of the salmon fishing industry for many years to come. 1. How can it be that the federal and provincial governments have such a short-sighted view of a problem that could devastate the salmon fishery (not only for us, but also for our neighbours to the south)? 2. Why does there seem to be such lack of concern about the position of our neighbours to the south who will be perhaps equally affected? I had assumed, perhaps incorrectly, that both levels of Canadian government were sensitive to the opinions of Americans – especially on matters of natural resources. I am scratching me head wondering why “we” are gambling with a potentially very serious problem. The Americans could very well charge that “we” had knowledge of a problem, did nothing about it, and now “they” were being forced to accept the consequences. Like supertankers, governments have difficulty stopping or changing directions. Bureaucracies would rather carry on even when misdirection is obvious to most others. Change means admitting to mistakes. Instead, they proceed as before, hoping that things might work out and their wrong decisions will never be proven absolutely. Government leadership qualities also play a role. In the case of the Federal government, we have a regime that frequently flouts accepted standards, misleads parliament and employs former criminals ! The provincial side of things – well it is documented and proven that the BC Liberal government is dishonest, deceitful and deceptive. Totally unable to make public announcements without lying. It should be no surprise that the end result is alienation – the USA doesn't like countries that interfere with the livelihood of their citizens. Canada needs too be very careful as legal compensation could very well be demanded by the US. That could mean big problems at a time when the country doesn't need it. Further lies and deception only makes things worse – but hey, what does Ottawa care – they reward crime and give the likes of Gordon Campbell a plum government position.